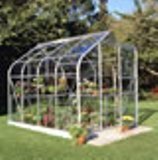 This is the Supreme 128 aluminium greenhouse which has been made with four roof vents which gives it healthy ventilation. This greenhouse looks elegant with its curved eaves. 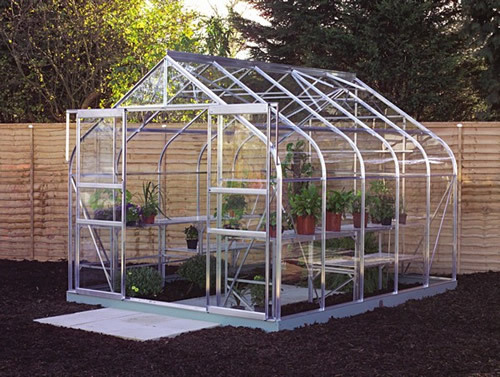 It's smoothed edges of this silver Supreme greenhouse gives added height up to 6'9 (2.12m), with added height you can grow taller plants as well as small plants. 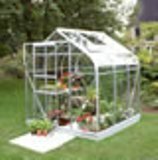 This is one of the bigger sized greenhouses to give you extra room for all your growing. Made elegantly for keen gardeners it comes in eight sizes to suit any sized garden. 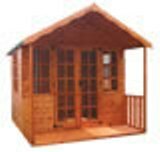 This model, the Supreme 128 comes with one roof vent for ventilation as standard but more vents can be purchased if you would like. For increased accessibility the Supreme Silver 128 comes complete with a set of sliding double doors and comes inclusive of horticultural glass. If you are looking for some more options we have various to offer you. 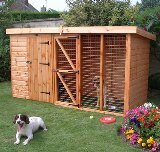 *Please note that the price of £1099.00 is for the silver option with horticultural glass. 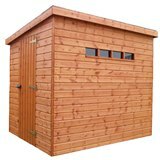 Windsor summerhouse 2.44 x 3.66m a flexible garden building with plenty of uses.